If you want to pump a whole lot of powerful sound and versatility into your PC or MP3 Player, Altec Lansing VS2521 Computer Speaker System is a surefire way to deliver uncompromisable sound right to your desktop. Boasting a powerful subwoofer w/ 5.25" long throw driver, you'll be able to feel the bass from your favorite music, movies, video games. A handy front panel input allows you to plug in your MP3 Player without disconnecting your PC, allowing you full access to your entire arsenal of music. Not a lot of space on your desktop? 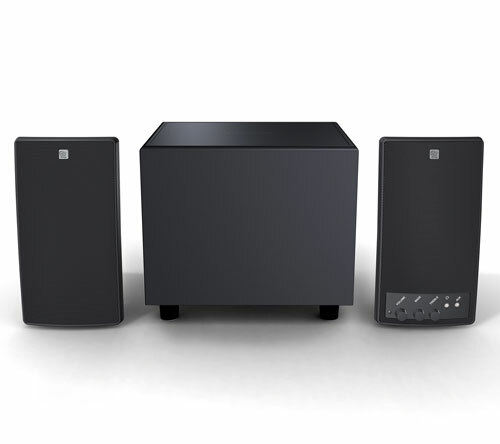 No problem, the Altec Lansing VS2521 Computer Speaker System comes with speakers that can be placed vertically or horizontally, allowing them to fit just about anywhere. Thanks to it's unique asymmetrical baffling, the listener will also be able to experience uncompromised sound quality while reducing standing waves and distortion. All of these noteworthy features are wrapped up in a distinctive, ultra-stylish design which features high tech, acoustically transparent metal grilles that will look terrific just about anywhere.